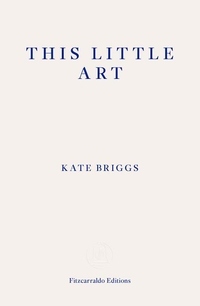 An essay with the reach and momentum of a novel, Kate Briggs's This Little Art is a genre-bending song for the practice of literary translation, offering fresh, fierce and timely thinking on reading, writing and living with the works of others. Taking her own experience of translating Roland Barthes's lecture notes as a starting point, the author threads various stories together to give us this portrait of translation as a compelling, complex and intensely relational activity. She recounts the story of Helen Lowe-Porter's translations of Thomas Mann, and their posthumous vilification. She writes about the loving relationship between André Gide and his translator Dorothy Bussy. She recalls how Robinson Crusoe laboriously made a table, for him for the first time, on an undeserted island. With This Little Art, a beautifully layered account of a subjective translating experience, Kate Briggs emerges as a truly remarkable writer: distinctive, wise, frank, funny and utterly original.